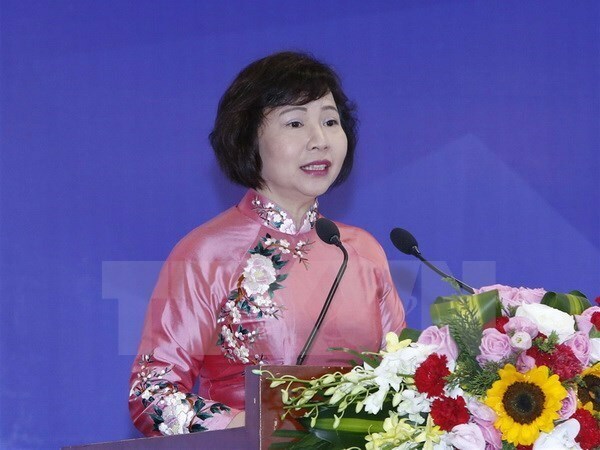 Hanoi (VNA) – Ho Thi Kim Thoa was dismissed from the position of Deputy Minister of Industry and Trade under a decision issued by the Prime Minister on August 16. Decision No. 1203/QD-TTg said that Thoa’s next task will be assigned by the Minister of Industry and Trade. The Party Central Committee’s Secretariat decided to relieve Thoa of her membership in the Party Civil Affairs Committee at the Ministry of Industry and Trade (MoIT) during a meeting chaired by Party General Secretary Nguyen Phu Trong on August 8, 2017. At the meeting, the Secretariat also proposed the Prime Minister dismiss Thoa from the post of Deputy Minister of Industry and Trade. It made the decision after considering the proposal of the Party Central Committee’s Inspection Commission and opinions of relevant agencies. Earlier, the Inspection Commission issued a warning against Thoa for “serious violations” while she was working at the Dien Quang company. It also proposed Thoa be stripped of all current positions. The commission said that while serving as Secretary of the Party Committee and Director of former State-owned Dien Quang Lamp Company, and then Secretary of the Party Committee, Chairwoman of the Board of Directors and General Director of the Dien Quang Lamp Joint Stock Company, from January 2004 to May 2010, Thoa violated regulations and procedures on business equitisation, and wrongly handled the loan interest worth 6.7 billion VND (298,000 USD) exempted by banks. She infringed State regulations on land management when the company signed a contract with another company to invest in the land area at No 12, Ton Dan Street in HCM City. She also failed to properly handle the 30 billion VND (1.3 million USD) collected from the transfer of the right of the land area’s use.